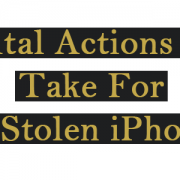 Before getting angry or sad, here are the top actions to take in case of a stolen iPhone. In recent time the iPhone is built to hold much info than a normal phone. Apple application can link your iPhones to valuable data such as your credit card detail, vital company info and much more. Besides the privacy of contacts, photos, and videos, serious harm can be done with a stolen iPhone. 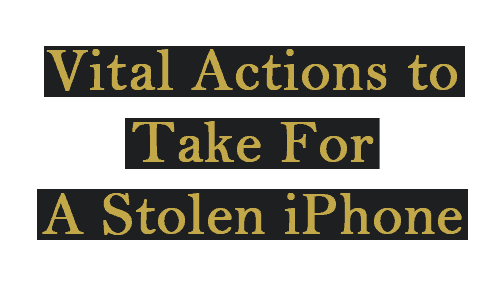 The following are 11 actions you should take to recover stolen iPhone or minimize the potential risks of a stolen phone. Information is a top priority in this digital age because of the harm that can be perpetuated. If there is a passcode set that is very cool. However it is not set, use Find My iPhone to add a passcode. As such the stolen iPhone cannot be assessed. Next, you may want to delete and back up data using iCloud. This action ensures that your personal data cannot be assessed. If the phone was issued by an organization, inform them to delete the phone from an existing network. For Apple pay customers should endeavor to unlink credit cards or debit cards with the iPhone. Although Apple Pay is very secure since it requires fingerprint or face scan but it is advisable to take this action. Try using Apple’s Find My iPhone service to track your stolen iPhone. Find my iPhone will give the location of the phone on a map and indicate if it is on the move. There are other third-party apps on the App Store that can also be used. If Find My iPhone locates your iPhone do not try recovering it yourself. Instead, take your receipt or proof of ownership and contact the local police department. File a report with the police about the stolen iPhone. This may help if Find my iPhone later locates the phone then you can contact them with more information. If the stolen iPhone was issued to you as an employee, notify them immediately. You may want to know the company stands on the issue before taking any action else to take laydown company policy. This is necessary because of valuable company documents on the iPhone. Ensure to call your cellphone company to report the issue to your cellphone company. Some phone companies may be more inclined to take action when you’ve got a police report, while others may act right away without one. Report the situation to your cell phone company suspend all transactions, calls, and messages. Before you cancel your phone service, try tracking it using Find My iPhone. Once service is turned off, you won’t be able to track it anymore. If you don’t have a passcode and aren’t able to set one using Find My iPhone. Consider changing your email account passwords will ensure no email can be assessed on the stolen iPhone. Beyond that, changing online banking, Apple ID, and other important account passwords will help prevent identity theft or financial theft. Report to your phone insurance company If you have an existing cover. Having a police report is necessary before reporting the situation to the insurance company will get the ball rolling in the meantime and help you get money to replace your phone if you can’t recover it. If your phone’s gone and you weren’t able to track it via GPS and/or lock it, you’re probably not going to get it back. It is important to notify the business and personal contacts of the situation. So that they won’t continue contacting the stolen iPhone. You may want to secure your iPhone better next time to avoid stress such as this. Be sure to take these steps in case of a stolen iPhone.